Messenger applications are very popular these days and are the backbone of communication at the moment. We keep in touch using them and occasionally share cat memes with our friends. Meow. However, one of the most important features of a messenger application is push notifications. These are alerts that are triggered when we are not currently using the application. This lets us know when a new message is received so we can respond. In this article, we will be building an iOS messenger application with a push notification feature. The application will allow users to chat with each other and when they are not currently in the application, they will receive a push notification telling them there is a new message waiting for them. SQLite installed on your machine. Install here. The first thing we want to do is create a backend application. This will be the API that the iOS app will connect to and perform specific tasks like authentication and more. This will create a new Laravel project in the current working directory and change to that project directory. When the installation is complete, open the project in your IDE or text editor. The dependencies we added are the Laravel Passport library, the Pusher Chatkit SDK and the Pusher Beams SDK. This will make it easy for us to work with both services in any PHP application. Next, run the following command in your terminal to install the dependencies. This will update (or install) the dependencies and make them available to our project. The next thing we want to do is create migrations for the database of the app. Migrations will help us manage our database tables. This will create two additional migrations in our database/migrations directory. Let’s start editing the migrations in this directory. That’s all for the migrations. 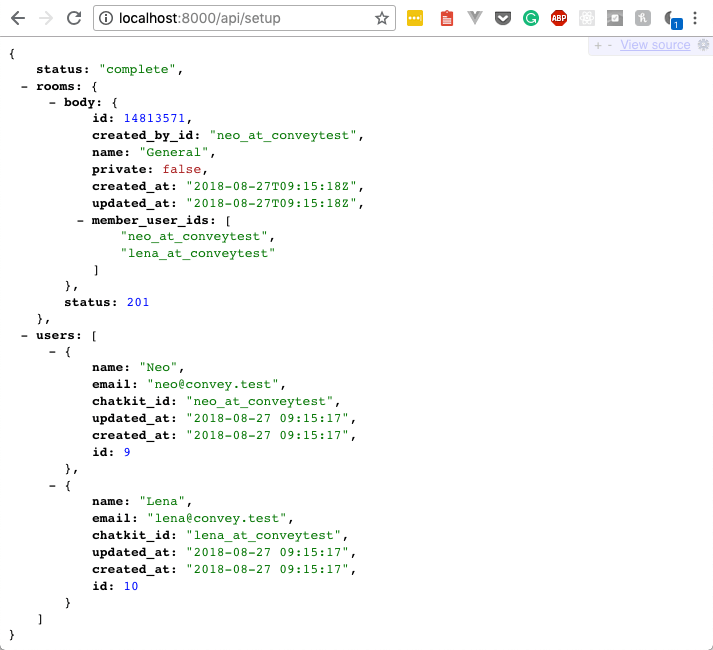 Let’s add a database connection for our application and run the migrations we just created. For our database, we are going to use SQLite, but you can any database you like. You should use a non-file based database like MySQL if in a production environment. When we run migrate, it will run all the migrations available to the application including the Laravel passport migrations. Speaking of Laravel Passport, let’s set it up. Note that we also added a chatkit_id property to the fillable array. Let’s create and modify the models so our application can use them. All our models are stored in the app directory. Above we have the Room model with standard properties we already know with Laravel. However, we have the getNameAttribute Eloquent accessor that we use to set the name attribute of the room. In this method, we check to see if the room is a channel and if it is we return the name of the room without modifying it. However, if it is a direct message room, we return a comma-separated name of participants as the name of the room. We don’t need to modify the RoomUser model. The next thing we want to do is set up Pusher Chatkit. Since we already installed the library using Composer, we will just create a model and a service provider so our Laravel application has an instance of our Chatkit library handy always. In the class above, we have extended the Pusher Chatkit SDK’s main class Chatkit\Chatkit. We have some new methods that help us achieve functionality that is not yet available to the SDK. Now, open your .env file and update your Pusher Chatkit application keys. If you hadn’t created a Pusher Chatkit instance before now, you should head over to the Pusher Chatkit dashboard and create an instance. If you hadn’t created a Pusher Beams instance before now, you should head over to the Pusher Beams dashboard and create an instance. Note though, that to create a Pusher Beams instance, you need an APNs token, launch Xcode and create a new Single application project named Convey before continuing with the Pusher Beams wizard. Now that we have done all the necessary setting up, let’s start creating our endpoints. Above, we have defined all the routes the application will need to function. Now, let’s create the handlers in our controllers. Above, we have a single method, create, in the UserController. This method first validates the submitted data, then creates a new Chatkit user, then finally creates a new user in the database. The next endpoint we want to create is the Chatkit token endpoint. This endpoint will simply generate a Chatkit token that the user can use to make authenticated requests directly to Chatkit from the iOS application. Above, we have the ChatkitController and we have a method called getToken. This method simply fetches the token for the current user and returns it as a response to the client. It also returns the associated user. The next set of endpoints we will create will be related to the rooms. We will create endpoints to create a room, join a room, get rooms already joined, and get rooms that the user can join. getJoinedRooms - get the rooms that have been joined by the user. getJoinableRooms - get the rooms that can be joined by the user. createRoom - creates a new private room between two users so they can message each other. addToRoom - adds the current user to a room. This endpoint will be responsible for sending push notifications to devices when a message has been successfully posted to a room. In other words, every time a message is posted to a room, we will hit this endpoint to send push notifications to all users in the room. Above, we have the method that sends push notifications using Pusher Beams. We use the room ID as the interest to push to. This will mean that, when we are joining a room from the client, we will subscribe to the interest which will be the Chatkit room ID. Before we run the application, let’s add a function that will quickly set up everything we need. It will create the accounts necessary both on the API and on Chatkit. It will also create a General room for the accounts to use. Now let’s go on to run the application. Now, if you visit http://localhost:8000 you should see the Laravel welcome page. To complete the set up of the application, visit http://localhost:8000/api/setup once. Neo - email: neo@convey.test and password: secret. Lena - email: lena@convey.test and password: secret. A General room is also created and both users are added to it. 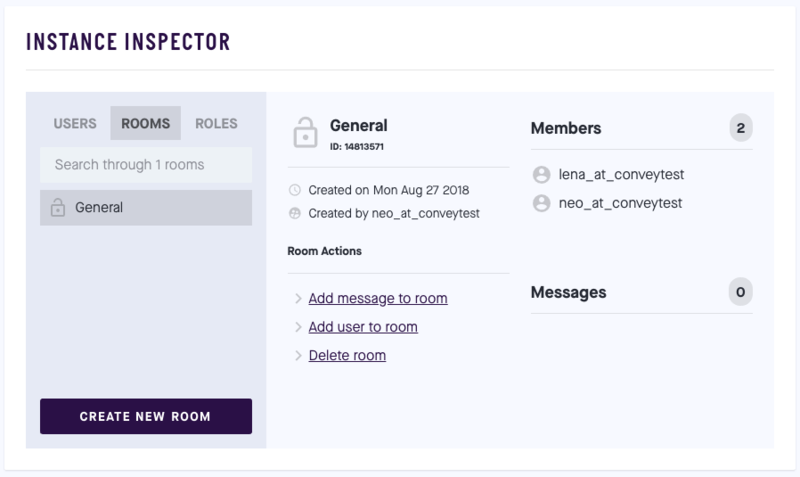 If you want to create new rooms, you can do so using the Pusher instance inspector in the dashboard. This will create the tunnel to your localhost and give you a web-accessible URL like we see above. Use the HTTPS URL as the API base URL in the iOS application we will create in the next part. In this part of the tutorial, we have been able to create the backend for our application. This backend will also be responsible for sending out push notifications anytime a message is sent in a chat room. In the next part, we will create the iOS messenger application that will connect to this backend.